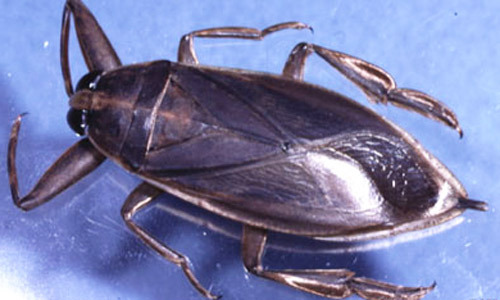 The heteropteran family Belostomatidae contains the giant water bugs. These large, predatory, aquatic insects have the largest body size among the Heteroptera. Adults of some South American species reach 4 inches in length. Individuals occur in ponds and ditches where they suspend below the surface, respiring through two abdominal appendages which act as siphons. During mating season they fly from pond to pond or pool of water. It is during these flights that these insects fly to lights in large numbers, earning their other common name, "electric light bugs". Individuals are capable of inflicting a painful bite with their strong beak, and may also pinch with their front legs. Individuals prey on aquatic insects, small fish, frogs, tadpoles, small birds, and other organisms they are able to capture. Powerful enzymes are injected into prey to kill them. Adults of Lethocerus are considered a delicacy in Asia, and are eaten both fresh and cooked. Figure 1. 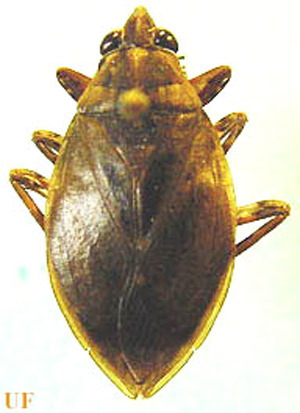 Dorsal view of an adult giant water bug, Lethocerus sp. Photograph by P. M. Choate, University of Florida. Figure 2. 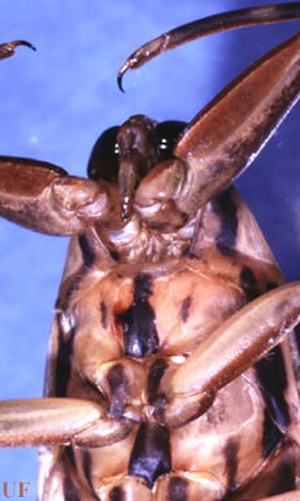 Ventral view of the head of an adult Lethocerus sp., a giant water bug. showing the beak. Photograph by P. M. Choate, University of Florida. Eggs of Lethocerus are deposited above water on vegetation and other objects. Eggs of Abedus and Belostoma are glued onto males' backs by females. Egg carrying by males is a unique feature in these two genera. Curiously, Kraus (1985) reported that in the absence of sufficient size males, eggs will also be laid on backs of females. Eggs hatch in one to two weeks, with total development time ranging from one to two months. Adults may overwinter in the mud. Figure 3. Giant water bug eggs, Lethocerus spp. Photograph by Lyle J. Buss, University of Florida. Figure 4. Giant water bug nymph, Lethocerus spp. Photograph by Lyle J. Buss, University of Florida. Figure 5. Dorsal view of an adult Abedus lutarium (Stål). Photograph by P. M. Choate, University of Florida. Figure 6. Ventral view of an adult Lethocerus uhleri (Montandon). (Note banded middle and hind legs). Photograph by P. M. Choate, University of Florida. Figure 7. Dorsal view of an adult Lethocerus uhleri (Montandon). Photograph by P. M. Choate, University of Florida. Lethocerus annulipes (Herrich-Schaeffer) - Florida? South America, West Indies; reported from Palm Beach, Florida. Lethocerus americanus (Leidy) - Newfoundland, Maine to British Columbia, south to Utah and Nevada, Mexico, Florida? Blatchley WS. 1926. Heteroptera of Eastern North America with especial reference to the faunas of Indiana and Florida. Nature Publishing Company, Indianapolis, Indiana. 1116 p.
Bobb ML. 1974. The Insects of Virginia: No. 7. The aquatic and semi-aquatic Hemiptera of Virginia. Research Division Bulletin 87. Virginia Polytechnic Institute and State University, Blacksburg, Virginia. 196 p.
Dubois RB, Rackouski ML . 1992. 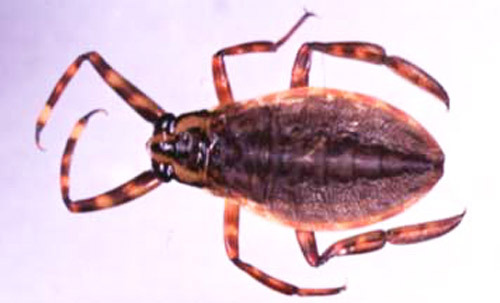 Seasonal drift of Lethocerus americanus (Hemiptera: Belostomatidae) in a Lake Superior tributary. Great Lakes Entomologist 25: 85-89. Flosi JW, Hart ER. 1987. Endocuticular growth rings as an indicator of age structure in Belostoma flumineum Say (Hemiptera: Belostomatidae). Iowa State Journal of Research 62: 189-198. Henry TJ, Froeschner RC (eds.). 1988. 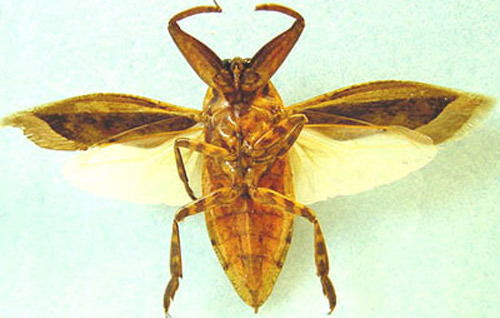 Catalog of the Heteroptera, or True Bugs, of Canada and the Continental United States. E. J. Brill, New York. 958 p.
Hungerford HB. 1920. The Biology and Ecology of Aquatic and Semiaquatic Hemiptera. Kansas University Science Bulletin XI: 1-256. Hussey RF, Herring JL. 1950a. A remarkable new Belostomatidae (Hemiptera) from Florida and Georgia. Florida Entomologist 33: 84-89. Hussey RF, Herring JL. 1950b. Rediscovery of a Belostomatidae named by Thomas Say (Hemiptera). Florida Entomologist 33: 154-156. Ichikawa N. 1988. Male brooding behavior of the giant water bug Lethocerus deyrollei Vuillefroy (Hemiptera: Belostomatidae). Journal of Ethology 6: 121-128. Ichikawa N. 1989. Breeding strategy of the male brooding water bug, Diplonychus major Esaki (Heteroptera: Belostomatidae): Is male back space limiting? Journal of Ethology 7: 133-140. Ichikawa N. 1995. Male counterstrategy against infanticide of the female giant water bug Lethocerus deyrollei (Hemiptera: Belostomatidae). Journal of Insect Behavior 8: 181-188. Keffer SL, McPherson JE. 1988. Descriptions of nymphal instars of Abedus breviceps (Hemiptera: Belostomatidae). Great Lakes Entomologist 21: 169-174. Kehr AI, Schnack JA. 1991. Predator-prey relationship between giant water bugs (Belostoma oxyurum) and larval anurans (Bufo arenarum). Alytes 9: 61-69. Kight SL, Sprague J, Kruse KC, Johnson L. 1995. Are egg-bearing male water bugs Belostoma flumineum Say (Hemiptera: Belostomatidae), impaired swimmers? Journal of the Kansas Entomological Society 68: 468-470. Kraus B. 1985. Oviposition on the backs of female Giant water bugs, Abedus indentatus: the consequences of a shortage in male back space? (Hemiptera: Belostomatidae) Pan-Pacific Entomologist 61: 54-57. Kraus WF. 1989. Surface wave communication during courtship in the giant water bug, Abedus indentatus (Heteroptera: Belostomatidae). 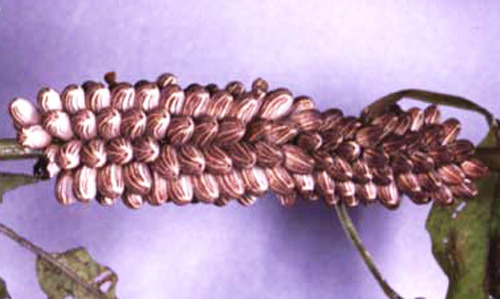 Journal of the Kansas Entomological Society 62: 316-328. Kraus WF, Gonzales MJ, Vehrencamp SL. 1989. Egg development and an evaluation of some of the costs and benefits for paternal care in the Belostomatidae, Abedus indentatus (Heteroptera: Belostomatidae). Journal of the Kansas Entomological Society 62: 548-562. Kruse KC, Leffler TR. 1984. Females of the giant water bug, Belostoma flumineum (Hemiptera: Heteroptera: Belostomatidae), captured carrying eggs. Annals of the Entomological Society of America 77: 20. Lauck DR, Menke AS. 1961. The higher classification of the Belostomatidae (Hemiptera). Annals of the Entomological Society of America 54: 644-657. Leidy J. 1847. History and anatomy of the Hemipterous genus Belostoma. Journal of the Academy of Natural Sciences of Philadelphia (2) I: 57-57. McPherson JE, Packauskas RJ. 1986. Life history and laboratory rearing of Belostoma lutarium (Heteroptera: Belostomatidae) with descriptions of immature stages. Journal of the New York Entomological Society 94: 154-162. Menke AS. 1960. 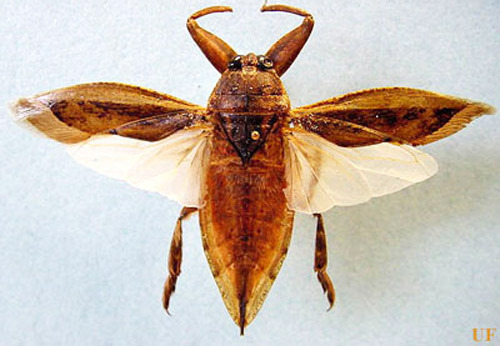 A taxonomic study of the genus Abedus Stal (Hemiptera: Belostomatidae). Univ. California Publications Entomology 16: 393-439. Needham JG. 1907. The eggs of Benacus and their hatching. Entomological News 18: 113-116. Pennak, R. W. 1953. Fresh-water Invertebrates of the United States. Ronald Press Company, New York. 769p. Smith RL, Larsen E. 1993. Egg attendance and brooding by males of the giant water bug Lethocerus medius (Guerin) in the field (Heteroptera: Belostomatidae). Journal of Insect Behavior 6: 93-106. Smith RL. 1979. Paternity assurance and altered roles in the mating behavior of a giant water bug, Abedus herberti (Heteroptera: Belostomatidae). Animal Behaviour 27: 716-725. Smith RL, Horton C. 1998. Fish predation on giant water bug (Heteroptera: Belostomatidae) eggs in an Arizona stream. Great Basin Naturalist. 58: 292-293. Venkatesan P, D'Sylva T. 1990. Influence of prey size on choice by the water bug, Diplonychus indicus Venk. and Rao (Hemiptera: Belostomatidae). Journal of Entomological Research 14: 130-138. Venkatesan P. 1983. Male brooding behavior of Diplonychus indicus (Hemiptera: Heteroptera: Belostomatidae). Journal of the Kansas Entomological Society 56: 80-87. Wilcox RS. 1995. Ripple communication in aquatic and semiaquatic insects. Ecoscience 2: 109-115. Publication Date: July 2003. Latest revision: October 2003. Reviewed: February 2019.